Usus Antiquior is making the propers for Sundays and Feast Days available online for print. The PDF's can be customized to include your parish's or institution's name. This is a great resource for those without a Missal. Please take advantage of this for you or a friend. 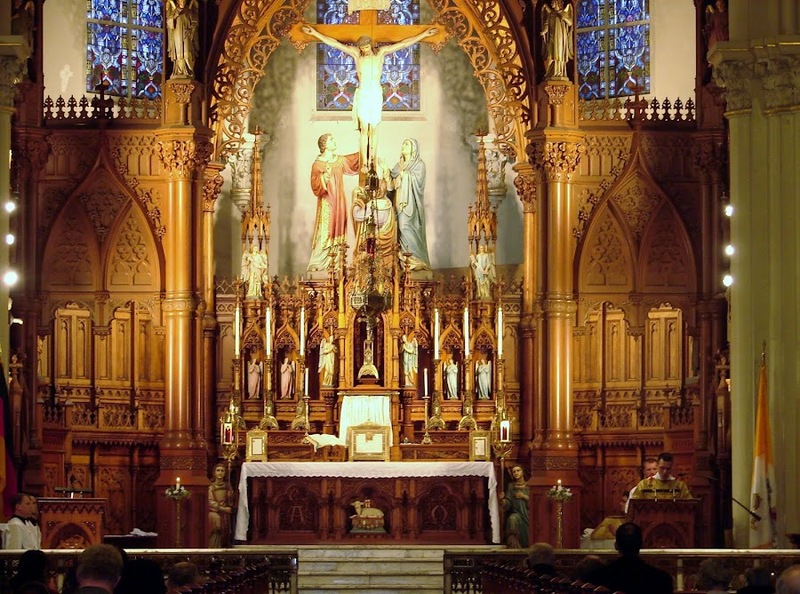 Our Lady of Mount Carmel parish in Cleveland, Ohio, will offer a Low Mass on the Sunday after Easter, April 15, 2012, now known as Divine Mercy Sunday, but known in the Tridentine calendar as Low Sunday. Mass will be at 2pm, with confessions available at 1pm. Following the Mass, the Blessed Sacrament will be exposed for adoration, the Divine Mercy Chaplet will be recited and then Benediction. Afterwards, you may have sacramentals blessed. In a decree dated August 3, 2002, the Apostolic Penitentiary announced that in order "to ensure that the faithful would observe this day (Divine Mercy Sunday) with intense devotion, the Supreme Pontiff himself established that this Sunday be enriched by a plenary indulgence…so that the faithful might receive in great abundance the gift of the consolation of the Holy Spirit. In this way, they can foster a growing love for God and for their neighbor, and after they have obtained God's pardon, they in turn might be persuaded to show a prompt pardon to their brothers and sisters." The plenary indulgence is granted under the usual conditions (sacramental confession, Eucharistic communion and prayer for the intentions of Supreme Pontiff) to the faithful who, on the Second Sunday of Easter or Divine Mercy Sunday, in any church or chapel, in a spirit that is completely detached from the affection for a sin, even a venial sin, take part in the prayers and devotions held in honor of Divine Mercy, or who, in the presence of the Blessed Sacrament exposed or reserved in the tabernacle, recite the Our Father and the Creed, adding a devout prayer to the merciful Lord Jesus (e.g. Merciful Jesus, I trust in you!). Below is the schedule for Holy Week liturgies.